The purpose of this tutorial is to get you set up as quickly as possible; it isn’t intended to demonstrate the features of FireWorks or explain things in great detail. This tutorial can be safely completed from the command line, and requires no programming. If you are having trouble with this tutorial, please post a message on the FireWorks Github page. If you cannot access the /data/db directory or if you are running MongoDB on a shared machine, make sure that the ``–dbpath` variable is set to a directory that you can access or set the appropriate permissions. If MongoDB is outputting a lot of text, you might want to start it in a dedicated Terminal window or use the --quiet option. You may also wish to set up your Mongo config in a file and use the –config option. If your MongoDB database is located on a different computer from your FireWorks installation, navigate to the computer containing the FireWorks installation and type lpad init or lpad init -u. Use the -u option only if you want to put all parameters (username, password, database name, etc.) within a single URI (see MongoDB connection URI). Running the appropriate lpad init command successfully will set up a file that points to your remote database (usually called my_launchpad.yaml). You can now run lpad commands from within this directory and FireWorks will automatically detect this file. Alternatively, use the lpad -l option to point to this file or set up this file as your default db location using the FW config. where <INSTALL_DIR> is your FireWorks installation directory. If you do not know your <INSTALL_DIR>, use the command lpad version to print it to the terminal. If you used the pip installation, you’ll need to download the tutorial files separately as explained in the Basic FireWorks Installation. If you are already curious about the various options that the LaunchPad offers, you can type lpad -h or lpad reset -h. The -h help option is available for all of the scripts and sub-commands (like reset) in FireWorks. For example, if you lpad reset using the --password option set to today’s date, e.g. 2012-02-01, you can bypass the prompt asking you to confirm the reset. If you’ve ever used other XML-based workflow systems, you might be surprised at how succinctly a workflow can be defined in FireWorks. This specification is all that FireWorks needs to bootstrap your computing job. Later in this tutorial, we’ll provide more details and demonstrate how to add a workflow within Python code (rather than files). "script": "echo \"howdy, your job launched successfully!\" >> howdy.txt"
The spec of the Firework contains all the information about what job to run and the parameters needed to run it. Within the spec, the _tasks section tells you what jobs will run. The ScriptTask is a particular type of task that runs commands through the shell. Other sections of the spec can be also be defined, but for now we’ll stick to just _tasks. Later on, we’ll describe how to run multiple _tasks or customized _tasks. This Firework runs the script echo "howdy, your job launched successfully!" >> howdy.txt", which prints text to a file named howdy.txt. The state of READY means the Firework is ready to be run. The name is an optional field that we can set to help query for FireWorks later on. In this case, we did not specify one so a default name was used. You have now stored a Firework in the LaunchPad, and it’s ready to run! The ScriptTask provides more options than what’s presented here; more details on using the ScriptTask can be found here. A Rocket fetches a Firework from the LaunchPad and runs it. A Rocket might be run on a separate machine (FireWorker) or through a queuing system. For now, we will run the Rocket on the FireServer itself and without a queue. The Rocket fetches an available Firework from the FireServer and runs it. You should see the text: howdy, your job launched successfully! In addition to howdy.txt, you should also see a file called FW.json. This contains a JSON representation of the Firework that the Rocket ran and can be useful later for tracking down a launch or debugging. You will now see lots of information about your Rocket launch, such as the time and directory of the launch. A lot of it is probably unclear, but you should notice that the state of the Firework is now COMPLETED. The message No FireWorks are ready to run and match query! indicates that the Rocket tried to fetch a Firework from the database, but none could be found. Indeed, we had previously run the only Firework that was in the database. We can set our Rocket Launcher to continuously look for new FireWorks to run. Let’s try this feature. You should see two outputs, one for each Firework we inserted. You can continue adding FireWorks as desired; the Rocket Launcher will run them automatically and create a new directory for each job. When you are finished, you can exit out of the Rocket Launcher terminal window and clean up your working directory. It’s important to understand that when you add a Firework to the LaunchPad using the lpad script, the job just sits in the database and waits. The LaunchPad does not submit jobs to a computing resource when a new Firework is added to the LaunchPad. Rather, a computing resource must request a computing task by running the Rocket Launcher. By running the Rocket Launcher from different locations, you can have different computing resources run your jobs. Using rapidfire mode is a convenient way of requesting multiple jobs using a single command. You must have MongoDB running locally on port 27017 for the above example to work. Otherwise, see below. Here a few modifications that you might already find useful. 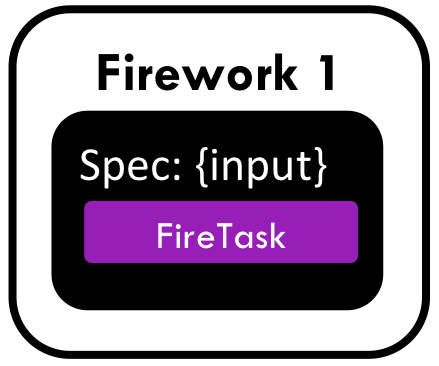 The to_file() and from_file() functions are available for many Firework objects, including the LaunchPad and Workflows (which are covered in a later tutorial). Technically, any class in FireWorks that subclasses FWSerializable (which is most of them) will allow serialization/deserialization to files if desired. FireWorks automatically detects what type of format you’re writing and reading from based on the extension. Both JSON and YAML are fully supported. Of course, if you’re using Python, there may not be any need to use files at all! The code above generally does not use a lot of the optional arguments to keep the examples looking clean and sharp. You might experiment with some of the options - for example, to set up logging when initializing the LaunchPad or control the parameters of rapid-fire mode. You can see the additional arguments by browsing the modules documentation. At this point, you’ve successfully stored a simple job in a database and run it later on command. You even executed multiple jobs with a single command: rlaunch rapidfire, and looked for new jobs automatically using the infinite Rocket Launcher. This should give a basic feeling of how you can automate many jobs using FireWorks. However, we still haven’t covered many important topics. For example, we have not executed complex workflows, run arbitrary Python code, or run jobs on different types of computing resources. Nor have we really looked into how to monitor and manage jobs and deploy FireWorks in production. We suggest that you continue by learning how to define jobs using Firetasks. Alternatively, you could return to the home page and choose a tutorial topic that suits your application.